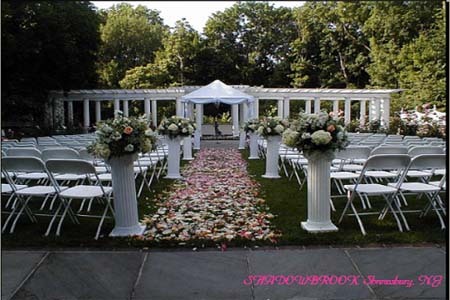 Outdoor weddings have an air of romance and are known for their natural beauty and charm. 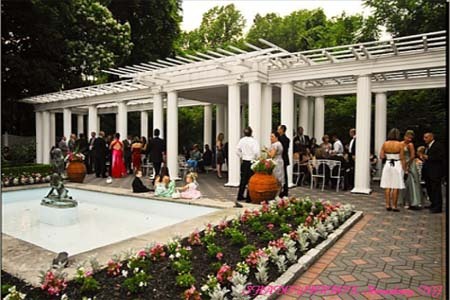 Planning an outdoor wedding has a vast number of wonderful possibilities and some risks. Familiarize yourself with my outdoor wedding ideas and we will begin your journey together, capitalizing on the beauty of nature and limiting the challenges of an outdoor affair. You and your fiance are planning an outdoor celebration based on your desire to gather your relatives and friends in a place that is special to you and will fulfill your fairy-tale wedding dreams. There are many spectacular places to have your outdoor wedding, the beach, by a river, in a park, backyard, garden, vineyard, on a mountaintop or in a sporting field. Most public places require advance permission and permits; so do your legwork ahead of time and avoid any surprise fees or restrictions. If you're going to have a back yard wedding consider using Jason from Luigi's. They are located in Lincroft, New Jersey and will travel within a 100 mile radius. The phone number is 732 842 2122. I've used Jason's services to cater a barbeque wedding and several sit down dinner weddings. Their staff is knowledgeable, always willing to please and all the guests have been delighted with his food choices and service. Think about your guests and how they will get to your outdoor site. Is your site accessible to the elderly, very young children and guests with special needs? 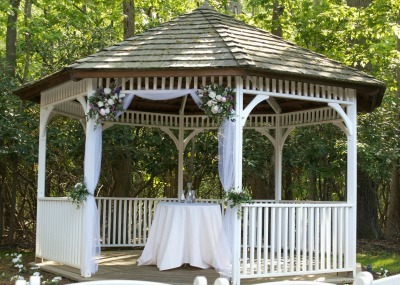 Will you have the ceremony and unique reception in the same venue or will you have your service outdoors and your reception at another location? A sunrise ceremony held outdoors will be fabulous, but will your guests share in your delight if they have to get up, dressed and travel to your site before sunrise? 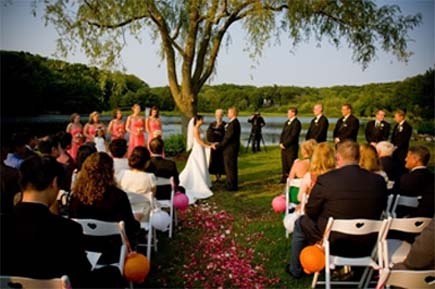 The climate and weather are certainly a legitimate concern when planning your outdoor wedding. Choose your bridal date based on the time of year that will most likely have favorable weather. A beach location is a unique, wonderful idea but it could be a nightmare if you choose to get married during the hurricane season. It’s best to be prepared for foul weather by having a back up plan. You can have a tent set up near your site to accommodate you and your guests in the event of inclement weather. Make certain the tent has ventilation, heat or air conditioning and will withstand wind and lightening. Since outdoor weddings are more prone to cancellation, a unique outdoor wedding idea would be to purchase wedding insurance thus limiting your financial impact in case your celebration is postponed or cancelled. If you are getting married during daylight hours, consider the location of the sun’s position in the sky, the intensity of glare and shadows during the time that you will be holding your affair. Will the sun be shinning in your or your guest's eyes making it difficult to see and causing you to squint? Talk with your photographer and determine the best time of day to take pictures using natural light. It is essential to make certain that your wedding bash has enough parking for your guests and service people. You certainly don’t want your guests to arrive at their destination and not have no place to park their cars. If parking is limited, consider a central parking place and have a bus shuttle your guests to your site. Some areas are bug prone and you don’t want you or your guests swatting at insects or getting bit by misquotes. It is a good idea to be prepared with citronella candles or other insect repellants. Voices can be drowned out by the wind, children playing in the background, birds chirping, passing traffic, the rush of water and other outside sounds. My advice would be to plan ahead and employ the use of a sound system. 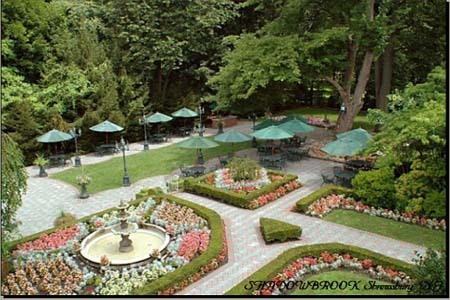 A unique outdoor idea would be to go to your site several times, picture your wedding taking place and determine if it fits your needs. Will electricity, emergency services, fire extinguishers and cell phone service be available? If your ceremony is going to be in a remote place I recommend assembling an emergency kit stocked with bandages, common medications, alcohol wipes, antibiotic ointment, peroxide, tweezers, rubber gloves, ice packs, feminine supplies, scissors and anything else you deem appropriate. Your dream of an open-air celebration will become a reality with unparalleled beauty and style. Using my unique outdoor wedding ideas will enhance your wedding memories.